The East Pool Whim is one of the few engine house in Cornwall with its engine in place. It is similar to the rotative beam engine at Cadia (Edward Higginbotham, 2006). With the increased demand for copper, the Cornish mine adventurers soon turned from tin to exploit this new resource. The richest deposits were located in a swathe from Camborne and Redruth to Gwennap. As time progressed, other deposits were exploited further east, culminating with Caradon Hill in 1836 and the huge Devon Consols (Devon Great Consolidated Copper Mining Company) in 1845. Fortunes were soon made from the richest deposits, though the Cornish miners themselves, the men, women and children, were rarely living at more than a subsistence level. “The single parish of Gwennap at this time yielded a full third and more of the world’s entire copper output, its population having doubled in the first three decades of the century…By 1841 the parish was the most populous in the whole country, its 10,796 persons exceeding that of Truro, Camborne and Redruth” (D. B. Barton. A History of Copper Mining in Cornwall and Devon. D. Bradford Barton Ltd. Truro. Second Edition. 1968: 51). Trends soon emerged in the development of the copper mining industry. As mines grew deeper, so the primitive pumping equipment became inadequate, demanding both improvements in drainage and pumping machinery. The adoption of explosives made mining more economic and enabled the construction of many kilometres of drainage adits and tunnels, often linking several mines together, the Great County Adit in the Gwennap area being the most extensive. The eighteenth century became a race to develop more efficient engines to allow pumping and raising of ores from deeper levels. Cornish miners were further pushed to innovate by competition from the open cut mines of the Parys Mountain in Anglesey, North Wales, which provided a glut of copper from 1768 to the 1790s. The development of pumping engines is associated with the names of Thomas Savery in 1698, with Thomas Newcomen and his first beam engine in 1717 and his first in Cornwall in 1720. Smeaton had nearly doubled the efficiency of the Newcomen engine by 1775, but it was the firm of Boulton and Watt at their Soho Works, whose engine with a separate condenser provided the efficiencies required to combat the threat from North Wales. 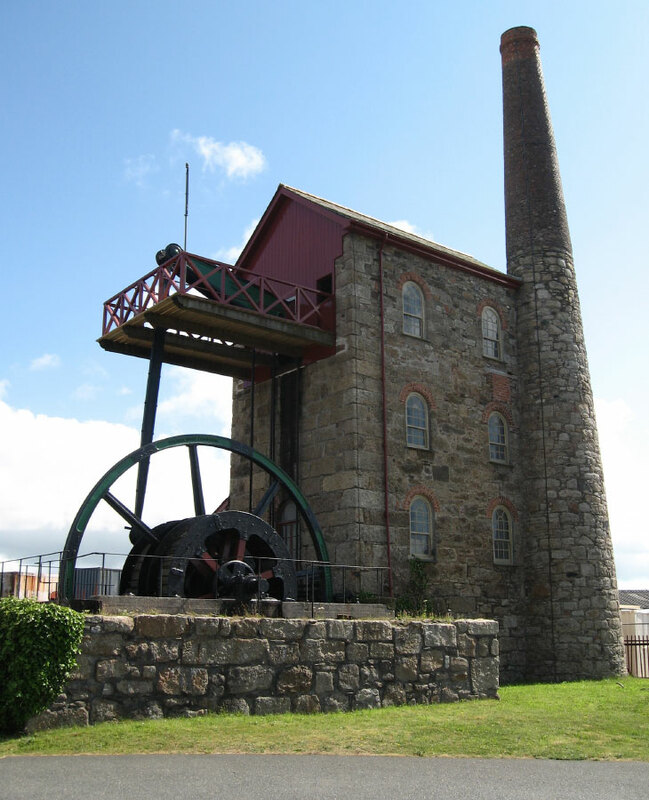 The first Boulton & Watt engine was put to work at Chacewater Mine in September 1777, but the Cornish were unable to break free from this monopoly until the patent expired in 1800. By this time the Cornish engineers were ready to market their own designs. Richard Trevithick, of Camborne (1771-1833), was the most famous of the Cornish engineers of this period. He was responsible for the adoption of high pressure steam power and the adoption of the safe, high pressure Cornish boiler. He erected his first engine at Stray Park, Dolcoath Mine in 1800, but was also responsible for innovation in small compact, high pressure engines, leading to ground breaking inventions in steam locomotion. The advent of the Cornish engine spurred on the development of deeper mines that served the industry through its peak period of production from the 1830s to the 1850s and are a familiar part of the Cornish mining landscape. Their reliable reputation led to the technology being exported internationally. Indeed Cornish engine houses are a familiar part of the Australian copper mining landscapes of South Australia, though the one at Cadia is the sole outlier in New South Wales.